David Dickinson is an Earth-science teacher, freelance science writer, retired U.S. Air Force veteran, and backyard astronomer who currently writes and ponders the universe as he travels the world with his wife. He's also the author of the new book "The Universe Today Guide to Viewing the Cosmos: Everything You Need to Know to Become an Amateur Astronomer". 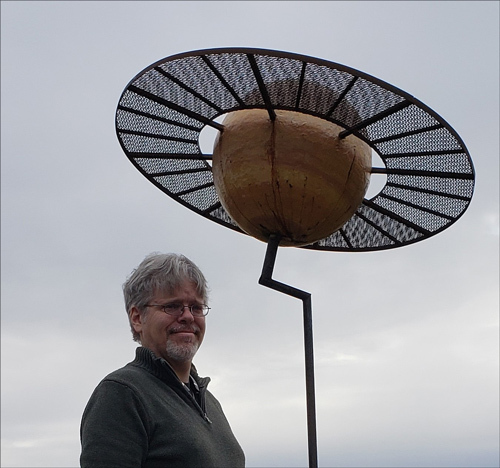 David made time in his busy schedule to answer a few of our questions about his new book and about the past, present, and future of amateur astronomy. Q: What course of events transpired to cause you to become an amateur astronomer? A: I was a big fan of the original Star Trek as a kid. I also remember catching the final Apollo missions in the early 1970s, and realizing that there were really folks willing "to boldly go where no man has gone before" (sorry about the split infinitive). This sci-fi-fueled childhood set the stage for a lifetime interest in astronomy. One of the biggest factors, though, was having the dark night skies of northern Maine right on my doorstep. When we went camping in western Maine in the summer, skies were darker still. Watching the August Perseids was also an annual ritual growing up. Q: When you have time to get out with your telescope, are you primarily a visual observer or imager? A: I'm maybe an 80% visual observer, 20% imager. I am in awe of what astrophotographers are doing today, and I like to dabble. That being said, astrophotographers tend to be driven to perfection, a necessary trait that maybe takes the fun out of things a bit. I do like to challenge myself with seeing something new every evening, whether it's a faint nebula or a new satellite. Q: What was your first telescope? A: A 40mm department-store Newtonian with an absurdly long focal length. It was a toy; the mount was flimsy, it was tough to aim, and I don't think I ever saw more than the Moon in it. Later, I got a 60mm Jason refractor, a much better instrument for the Moon and planets. My first 'serious' astronomical 'scope was a Celestron C8 Schmidt-Cassegrain. Q: What's your current favorite telescope setup? Scope, eyepieces, accessories, camera, and so forth? A: I travel lots, so I downsized my rig to a 5" Orion Maksutov-Cassegrain with an Explore Scientific alt-azimuth mount. The whole rig breaks down into an airline carry on, allowing me to use it for observing and public outreach in some pretty far-flung places. There are no motors or go-to drives in the setup; the Telrad is the only battery-powered part of the rig. Go-tos have their place and I've used 'em lots, but I prefer mostly to simply manually aim the scope during public outreach events. Plus, I think there's something to be said for keeping up proficiency in terms of star-hopping and knowing your way around the night sky. Q: What's your favorite celestial object (or type of celestial object) to observe with a telescope? A: That's a tough one. A bright comet is always a rare treat. I also like close double stars for the challenge, plus, they're good targets for light-polluted skies. Planetary nebulae are interesting, as well to consider that our own solar system may look like one for the pleasure of some alien star party one day. I also like to go for obscure but fascinating objects like Hind's Crimson Star for something unique... handy to know when every other 'scope down the row at a star party is aimed at Saturn. 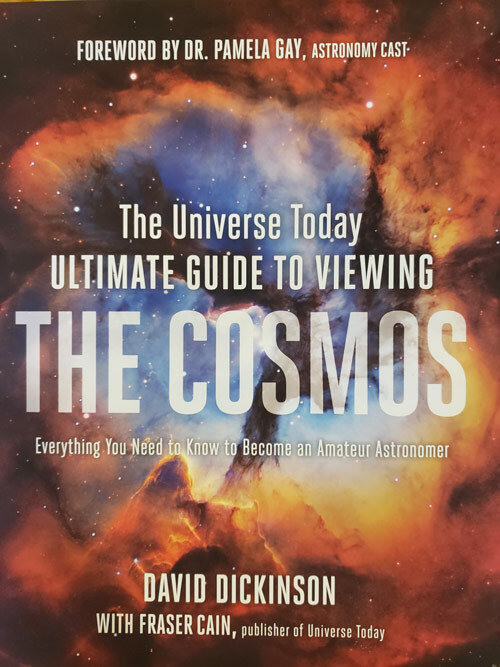 The cover of "The Universe Today Guide to Viewing the Cosmos: Everything You Need to Know to Become an Amateur Astronomer"
Q: Your new book, "The Universe Today Guide to Viewing the Cosmos: Everything You Need to Know to Become an Amateur Astronomer" came out on October 23, 2018. What was your inspiration for writing it, and how is it different from other books in the same field such as Nightwatch or The Backyard Astronomer's Guide? A: Fraser Cain (publisher of UniverseToday.com) and I had the idea around for a while: a guide to amateur astronomy, updated for the modern internet era. The unique slant for the book is the resources and tools geared towards modern amateur astronomers, whether it's tracking new comets, observing satellites, or sharing and processing images. It was a tall order, as the landscape of modern astronomy is changing so quickly. This guide embraces amateur astronomy in the modern internet era. Q: Does the book cover strictly visual observing, or does it also cover astrophotography? A: Both. The first half of the book walks the user through finding your way around the sky by seasons, observing the Moon and planets and top deep-sky objects. It also has entire chapters devoted to observing satellites, meteor showers, aurorae, comets, and safe solar observing. Finally, there's an entire chapter on Astrophotography 101 devoted to taking the novice from shooting bright objects such as the Moon through to basic deep-sky shooting over the steepest part of the learning curve. Q: How does your book approach the subject of how a new stargazer should choose a first telescope? A: Chapter 2 is devoted to gear and tech talk, the types of telescopes and which one is the best for what purpose. We talk lots about mounts, too, an often overlooked but essential aspect of the telescope experience. Our mantra is that the best telescope is "the one that you'll use the most." 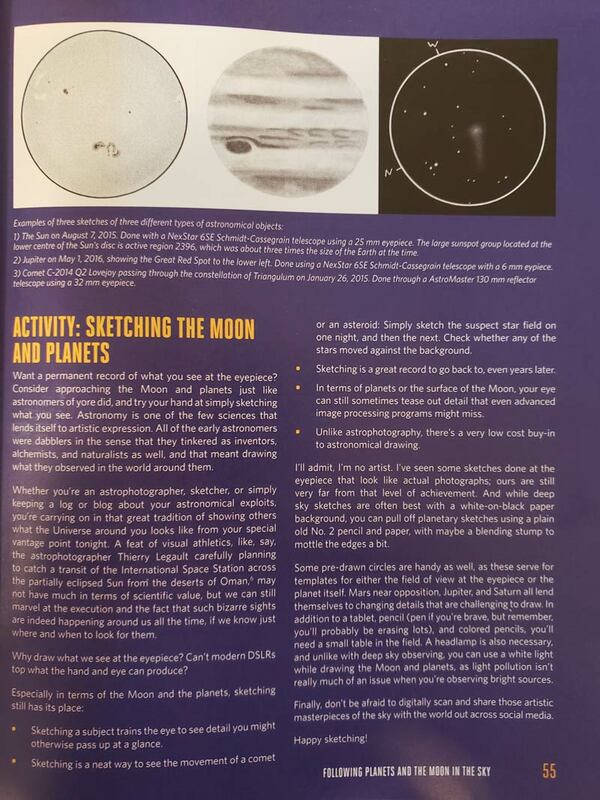 A sample page from"The Universe Today Guide to Viewing the Cosmos: Everything You Need to Know to Become an Amateur Astronomer"
Q: What kind of useful or unexpected information would an experienced amateur astronomer find in your book? A: Each chapter has an up-to-date list of resources at the end indexed by chapter; these are sites I'm looking at daily and weekly, places with crucial information. We also researched and compiled some unique lists of anything from the best satellites to track, to the brightest comets for the past century, to astronomical events to watch for over the next six years..
Q: In your book, you have some excellent suggestions for more advanced projects for amateur astronomers. Can you describe a few projects that might be a good place to start for those wishing to move beyond visual observing or astrophotography? A: We brainstormed 40+ projects for the book. About 20+ projects (2-3 for each chapter) made the final cut, including anything from making a stove pipe telescope to a card board interferometer for close double star observing. There's only one (making a sun funnel for solar observing) that I've never done personally; Dr. Pamela Gay, who wrote the forward of the book, provided the images for that one. Q: How is amateur astronomy different now from, say, 20-25 years ago? A: Today, a "big scope" starts at around 10" in aperture. The price of a serious telescope for astronomy has actually come down over the last few decades, which is a great thing. DSLRs have also lowered the entry bar for astrophotography, allowing anyone with a tripod and a camera to start taking decent star trail pics, tonight. But the most amazing aspect is the wealth of information that's out there. When I was a kid, knowledge in astronomy was limited to the two outdated books in the library. I didn't even know how to pronounce 'Auriga' or 'Ophiuchus' properly, until I got out in the world and heard other astronomers say them! The game today is to parse out the flood of information that's there for the taking. Q: How do you think amateur astronomy will change over the next 10-20 years? A: Folks with smartphones are starting to do acceptable deep-sky astrophotography. 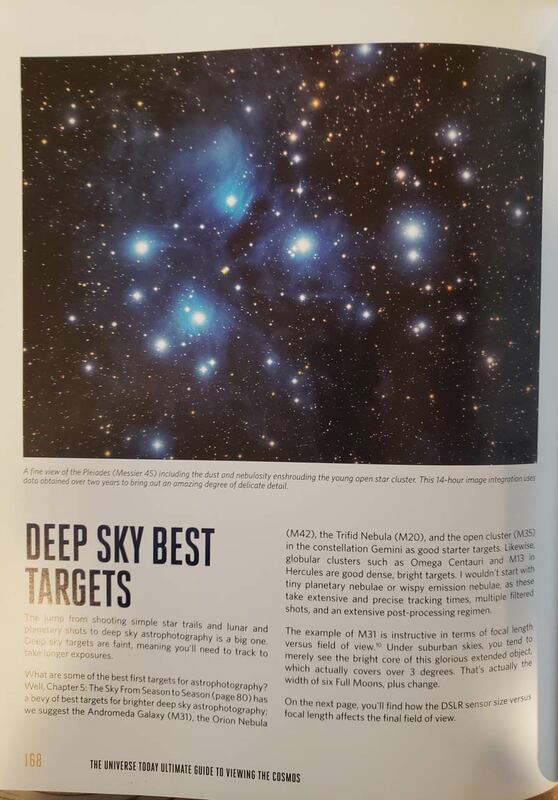 Also, there are signs that new telescopes equipped with image intensifying eyepieces (I mention 'em in the book) are the 'next big thing,' though I'm on the fence about these, as I've yet to see one in action. But I think the next big revolution is the flood of data that new telescopes such as the Large Synoptic Survey Telescope (the LSST) is set to produce, data that will be freely available for amateur desktop sleuths to sift through looking for new comets, asteroids, and who knows what else? Q: Can amateur astronomers still contribute to original scientific research with their observations? Or does the best way forward involve crowd-sourced data analysis of data from professional astronomers by amateur astronomers? A: Yes, though I will add the caveat that crowd-sourced data is now definitely part of the game. Amateurs still record occultations, monitor variable stars, and discover the occasional comet. We have had to up our game to keep up with the big guns, though. I know amateurs with automated observatories in their backyards that would be the envy of many a major university. Q: Can you share one of your most memorable experiences as a stargazer? A: Can I have two? One is an auroral display I witnessed from Northern Maine in the early 1980s as a teenager. It was so bright it was casting shadows, with vivid curtains of yellows and reds. I also watched aurorae from Alaska for years, and never saw anything as amazing as that one night. Number two was watching the 1998 Leonid meteor storm from the deserts of Kuwait. I was deployed there with the U.S. Air Force, and we watched the Leonids from behind tent city until sunrise, as fireballs lit up the scene every few seconds. Note that, both of these observations were without a telescope, simply watching the sky with the naked eye. I've seen totality during a solar eclipse, and I'd still put it in third place behind a good aurora display or a meteor storm (sorry, eclipse chasers). Q: Do you have some advice for aspiring amateur astronomers? How about advice for those who have been stargazers for quite some time, and whose interest may be waning? A: Start simply with a sky chart, and learn the sky. Maybe you'll remain happy with knowing the stars and constellations from season to season, or maybe you'll want more and go down the avenue of astrophotography, eclipse chasing, going after faint fuzzies, etc. But realize: it's a big Universe, and astronomy is a lifetime pursuit with something new to learn, every day. Be sure to challenge yourself, and maybe track down a new object each night. And never pass up a clear night! Q: Where can readers find out more about your new book? A: By buying it on Amazon. You can find it at this link. And please leave a review!